Library leadership is something I approach passionately. Why is library leadership important? It is the path to truly excellent library service. Without strong leadership libraries can’t succeed. In order for libraries to succeed, they need effective leaders and in order for leaders to be effective they need to be prepared. What are leaders? Leaders are influencers. Leaders innovate and develop. Leaders keep the long range perspective in mind. They exhibit new ideas and challenge the status quo. Leaders focus on and develop people. Leaders continually question. And leaders aren’t just the people at the top of an organization. Committee chairs, working group leaders and well trusted colleagues all hold important leadership roles in an organization. My first piece of advice to anyone moving into library leadership is to get familiar with these notions. But don’t just take my word for it, research what others say about essential skills for library leaders and familiarize yourself with the concepts they list. Find a mentor (formal or informal). Form a “Community of Practice” or “Mastermind Group” of other developing leaders to share your experiences and learn from one another. Create a daily reading list (including the campus or local newspaper, Chronicle of Higher Education or other industry publication, blogs, twitter, etc.). Map out time on your schedule to accomplish this. Conduct a skills assessment–where do you most need to grow? Apply to a leadership development program (ALA’s Emerging Leaders, Harvard’s Leadership Institute, Educause/CLIR Leading Change Institute, etc.). Learn your organization’s mission(s), vision(s) and values. Write a personal mission, vision and values statement. Schedule “thinking time” and “reading time” on your calendar. You may not always honor it but you will honor it more often than if you don’t schedule it! Adopt an innovator’s approach to your work. Are you transitioning to library leadership? I would love to hear about your triumphs and challenges. Have you learned your own leadership lessons? Share your wisdom! Ever feel like you walked into work one day and no longer knew the workplace expectations? Sure, you do your best to be great at your job, but what helps a librarian be a leader in today’s job market? When you think about libraries over the past 20, 10, 5 or even 2 years, a tremendous amount has changed. The same is true for the way we work: workplace expectations have changed. People approach change differently. 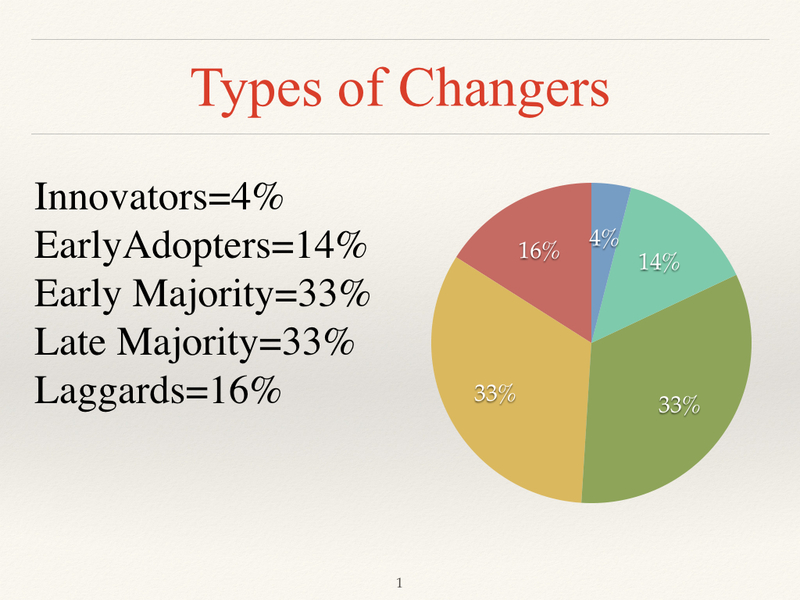 Some people are innovators or early adopters at the vanguard of change. 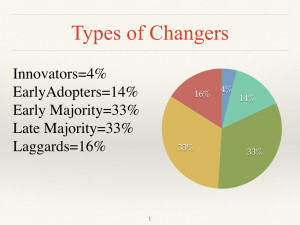 Others are laggards who resist change. Most of us fall in the middle. Change can be stressful and scary for some. Workplace Expecations: Understand that people approach change differently. Today’s workforce is expected to understand change. We all need to think about change and how it effects us. We need to learn about the change process and how it might effect our colleagues. One model of the change process that I find particularly useful is the Transtheoretical Model, which lays out several stages of change. Today’s workplace is full of experts and true innovation occurs across functional lines. This means that an essential workplace expectation is collaboration–working together with people who have different expertise. This means that you have to know your stuff. You may be the only person on a given project who knows what you know. It also means you have to know how to communicate and work well with others. Because of the high degree of collaboration in today’s workplace we are all expected to communicate well. This extends to nonverbal communication and active listening. It also extends to communicating with people of different genders, backgrounds and generations. Because of the fast pace of work output it also means we need to master several different communication modes–email, IM, report writing, telephone etiquette, presentations, meetings–and stop and think before we decide which is the best choice. Once we have made communication choices we have to carefully craft and execute our communication. We are expected to be able to manage ourselves, our colleagues and our bosses. By manage I mean take responsibility. We need to control ourselves, and enable ourselves and our colleagues to do our very best. We need to continually inform our bosses of what they need to know and occasionally suggest what they should do next. And we need to do this according to the “platinum rule.” While the “golden rule” states, “do unto others as you would have others do unto you,” the “platinum rule” states, “do unto others as others would have you do unto them.” This is where the essential skills of communication and emotional intelligence come in. Mastering emotional intelligence will probably help you get further than any of the other workplace expectations I describe. That is because it is comprised of self-awareness, self-regulation, motivation, empathy and social skills. All of these elements help you to work effectively with colleagues. The good news is that while some of these traits are hard-wired for some people, they are not impossible to learn. With study and practice, all of these essential workplace expectations can be improved, even mastered. I would love to hear your thoughts on workplace expectations and how you have worked on mastering them.